I would say that maybe 1% of the voice lessons I see on Youtube have any value at all. And even that 1% are tricky, in that it’s very hard to know if your doing them correctly without the immediate feedback of a trained ear to guide you. is it normal for my voice to hurt after doing these exercises? What was I supposed to actually be doing during this exercise? What does this have to do with singing? So, my diaphragm is in my belly? So, I’m supposed to sing through my nose? Common things I’ve seen being taught incorrectly on You Tube Free Singing Warm Ups…….. This exercise will strengthen your “singing muscles” (Proper singing technique is about coordination, not strength). And doing something improperly over and over, will not make you stronger, it will hurt your voice! Lip Rolls (Lip and tongue Trills) that are taught exactly wrong…….meaning way too forceful and forward. If you push during these exercises, why wouldn’t you push during singing? 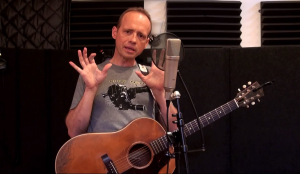 Push your belly out while you sing ……being told in the video that this is “how to sing from the diaphragm. (No, it is not!!!! That is not how the diaphragm works). And pushing in either direction (in or out) with your stomach during singing is only going to conflict with the freedom of the actual diaphragm and the other (involuntary) muscle groups in the torso involved in supporting singing. The diaphragm is not the only thing involved in the breathing process. Push more air through your throat when you sing higher. (This is a great recipe for really hurting your voice). The voice already requires more air to sing higher. This means you need to learn more………. (wait for it….) …….CONTROL. Not more force. You can certainly learn to have an airy or “not airy” tone through out your range, but that’s called……(wait for it…) ……TECHNIQUE. OMG. Yep some stuff that ya just probably won’t get from from a 5 minute voice lesson on You Tube, by someone that shouldn’t be teaching voice in the first place. These improper “tips” will cost you a lot more time than they will save you. Practice doesn’t make perfect……….Perfect Practice Makes Perfect!!!! No one ever got good at an instrument without locking themselves in a room for awhile and getting obsessed with it. If your going to go to the trouble, then get some valuable instruction to spend all that time with. IT WILL SAVE YOU YEARS!!!!!!! If you’re going to try and DIY learning such a tricky instrument, then do some research, and at least find qualified teachers to learn from. Then as much as possible, find a great teacher to get some feedback on what you’re learning. Internet sessions have made it possible to work with great teachers from all over the world. More resources are available at this time in history than ever before. The money you spend now will be a lot less than paying someone to untangle the mess you made by learning something wrong.